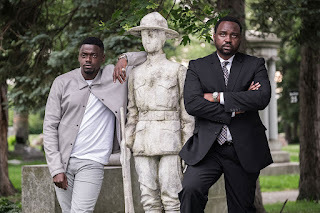 A crime-and-corruption thriller, Widows offers a character-rich and intricate story mixing heist thrills with political connivance. In Chicago, Harry Rawlings (Liam Neeson) and his gang are ambushed and annihilated after a botched heist to steal $2 million in cash from mobster and wannabe politician Jamal Manning (Brian Tyree Henry). 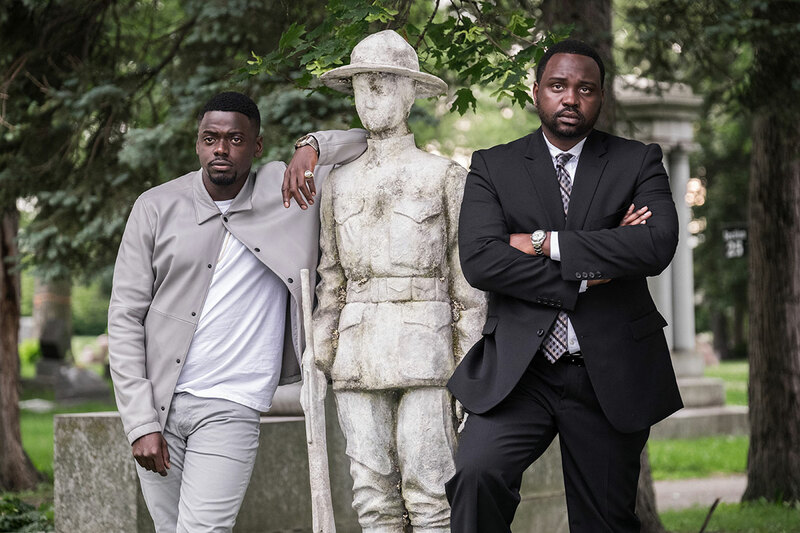 The money went up in flames, and Harry's widow Veronica (Viola Davis) is immediately under pressure from Jamal and his vicious brother Jatemme (Daniel Kaluuya) to pay back their losses. Jamal is competing with Jack Mulligan (Colin Farrell) for a city council seat left open by the resignation of Jack's father Tom (Robert Duvall). In a city rife with corruption the Mulligans have always held power. Now the Mannings want in, while Jack is much less interested than his father in the machinations of local politics. Meanwhile Veronica is desperate to raise money to pay back Jamal, and recruits the widows of Harry's gang, including Linda (Michelle Rodriguez) and Alice (Elizabeth Debicki), to attempt a $5 million heist using detailed plans Harry left behind. 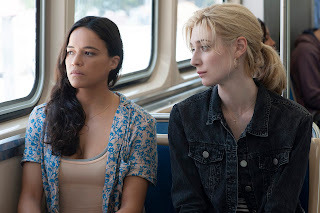 Directed by Steve McQueen who also co-wrote the script with Gillian Flynn, Widows is an engrossing, multi-layered story overflowing with subtext. Featuring overlapping plots, the action sequences are short, sharp and sudden, injecting large boosts of energy at crucial junctures, then making way for the many compelling characters to take over and develop. The film tackles several weighty themes.Women emerging from the shadows of their husbands is the thread carried by Veronica, Linda and Alice, and all three have powerful growth arcs triggered by the near-total loss they each suffer at the outset. The three women have plenty to prove, first and foremost to themselves. Veronica was enjoying a comfortable life in a cushy and expensive apartment. Linda unknowingly allowed her man to run her small business into the ground. Alice was accepting of a relationship filled with abuse. Now they have to snap out of passivity and rely on their own guile to extricate themselves out of a jam created by their men. All three will find resilience and resourcefulness, often at unexpected times and places. The intersection of corruption, racial tension, and politics is the second major motif weaving through the film. This is the domain of men seeking to preserve power in the case of the father and son Mulligan duo, or to wrest control, as pursued by the brothers Manning. Whether white privilege hanging on or black influence rising, none of the characters even pretend to work for the good of the citizenry. The superficial community speeches are a thin cloak to hide naked grabs for money and influence. Jack Mulligan pursuing political office while barely disguising his disgust is another interesting angle explored by Widows. Here the sins of the old-school father are imposed on a slick son not nearly as comfortable with the games politicians play in public, but more than happy to partake in backroom deal making. Grief emerges slowly as an initially invisible but ultimately hugely influential emotion propelling the narrative. Veronica and Harry are suffering through the consequences of a family devastation brought forth by their racially mixed household, and the fog of loss profoundly haunts their marriage. Veronica's plight will collide almost head-on with the election campaign, as McQueen and Flynn introduce more than one clever twist to enrich the film's texture. By the time the women have grabbed hold of their destiny they will unknowingly but violently shake the ground below the men, and for all the careful plotting by both criminals in masks and criminals in suits, the film climaxes with a succession of unplanned real and metaphorical power shifts. The astounding cast is in top form. Viola Davis and Colin Farrell lead the way with composed performances, ably assisted by some quietly astute and nuanced work from Elizabeth Debicki and Daniel Kaluuya's startling venom. Widows is a masterful achievement, an intelligent film where visible and invisible crimes abound, as do the opportunities to grab and define new destinies.